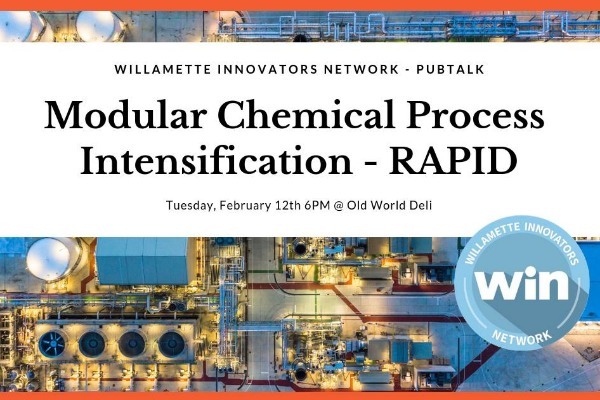 PubTalk: What is Modular Chemical Process Intensification? The Willamette Innovator Network's PubTalks in 2019 are new and improved! Kick the evening off with networking where you can connect with old friends and meet some new ones, then watch a couple of early-stage companies pitching their businesses to you. After the pitches, David McFeeters-Krone from Intellectual Assets, Corp. will share about the RAPID Institute. RAPID stands for Rapid Manufacturing Institute for Process Intensification, one of 14 national manufacturing institutes. RAPID is develop platform technology that will shrink the size of a chemical plant ten-fold. It can also increase the production of biofuels by a factor of ten. This all means lower input costs and higher output. David is a commercialization consultant with strong professional knowledge of licensing and IP and has worked for Intel, NASA, and MIT, national labs and has been a business development consultant, technology scout and capability broker for companies large and small. Tickets are $10-$20. Buy tickets.